The Signature Chocolate Cabinet: a sensational centrepiece brimming with more than 100 filled chocolates and Nano Slabs. The grand gesture. 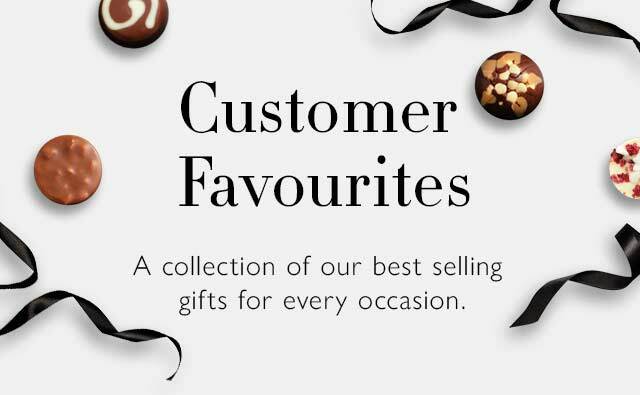 It's time to throw caution to the wind: show someone how you truly feel with this glorious showcase of more than 100 of our best-loved chocolates. We keep all our working creations in a cabinet just like this in our inventing room, so we know There's a frisson of excitement that comes with opening every drawer; whether you're hiding a certain piece of jewellery in one of the apertures or hoping to surprise a group of friends, this spectacular collection never fails to make an impression. 1,450.00 g / 51.15 oz. Ingredients: cocoa solids (cocoa mass, cocoa butter), sugar, full cream MILK powder, HAZELNUT paste, stabilisers (sorbitol, glycerol), sweetened hazelnut paste (HAZELNUTS, sugar, emulsifier (sunflower lecithin)), butter oil (from MILK), runny caramel (glucose fructose syrup, sweetened condensed MILK, half salted butter (from MILK), sugar, salt, emulsifier (SOYA lecithin), water), glucose syrup, whipping cream (cream (from MILK), stabiliser (carrageenan)), marzipan (ALMOND NUTS, sugar, water, invert sugar syrup), skimmed MILK powder, caramel half-salted butter (glucose fructose syrup, sweetened condensed MILK, half salted butter (from MILK), sugar, water, salt), florentines (ALMOND NUTS, sugar, butter (from MILK), glucose syrup, honey, cream (from MILK), HAZELNUTS), HAZELNUTS, walnut paste (WALNUTS, sunflower oil, citrus fibre, emulsifier (SOYA lecithin)), PECAN NUT paste, fruit juice concentrates (strawberry, raspberry, mango, carrot, apple, blackcurrant), vegetable oils (palm, rapeseed), PEANUT paste, emulsifiers (SOYA lecithin, sunflower lecithin), feuilletine (sugar, WHEAT flour, butter oil (from MILK), MILK protein, MILK sugar, malt extract (from BARLEY), raising agent (sodium bicarbonate), salt), pistachio paste (PISTACHIO NUTS, rapeseed oil), nibbed HAZELNUTS, whole MILK powder, ginger pieces (dextrose, ginger, glucose syrup, sugar), caramelised sugar, whole MILK, sticky toffee sauce (sugar, cream (from MILK), butter (from MILK), flavourings), sunflower oil, icing sugar, cream (from MILK)), shortcake biscuits (wheat flour (WHEAT flour, calcium, iron, niacin, thiamin), non-hydrogenated vegetable fat (palm, shea, rapeseed), sugar, invert sugar syrup, tapioca starch, salt, raising agents (sodium bicarbonate, ammonium bicarbonate), emulsifier (sunflower lecithin)), champagne (SULPHITES), whisky, cognac, neutral alcohol, tequila, MILK fat, rum, candied orange peel (orange peel, dextrose, glucose syrup, sugar), cocoa biscuits (wheat flour (WHEAT flour, calcium, iron, niacin, thiamin), sugar, vegetable oils (palm, rapeseed), cocoa powder, malt blend (glucose syrup, BARLEY syrup, malt extract (from BARLEY)), skimmed MILK powder, raising agents (sodium bicarbonate, tartaric acid), salt, flavouring), nibbed PECAN NUTS, lemon concentrate (lemon, acidity regulator (citric acid), lemon essential oil), dextrose, invert sugar syrup, gin, yoghurt powder (from MILK), golden raisins (raisins, sunflower oil, preservative (SULPHITES)), flavourings , Arabian coffee paste (coffee paste, refined sunflower oil, flavouring, fruit extract, glycerin), freeze dried strawberry powder, orange flavoured liqueur, concentrated whey (from MILK), meringue pieces (sugar, non-hydrogenated vegetable fats (shea, palm oil), WHEAT starch, EGG white), ALMOND NUTS paste, lime puree, desiccated coconut, organic cocoa powder, amaretti biscuits (sugar, WHEAT flour, apricot, EGG white, raising agents (sodium bicarbonate, ammonium bicarbonate)), cinnamon paste (glucose syrup, cinnamon, plain caramel, essential oil (cinnamon)), natural colours (beetroot, carotene, paprika, annatto, anthocyanin), acidity regulators (malic acid, citric acid), ground cinnamon, freeze dried raspberry powder, sea salt, freeze dried raspberry pieces, crisped rice (rice flour, sugar, salt, cocoa butter), organic ground coffee, freeze dried strawberry pieces, vanilla seeds, MILK protein, essential oils (orange, lime, lemon), dried mint leaves, ground nutmeg, concentrate of spirulina, vanilla extract, whey powder (from MILK), glazing agents (glucose syrup, sugar, gum arabic, vegetable fat, modified starch (potato, maize)), Habanero chilli powder, spices.Dark chocolate contains minimum 70% cocoa solids.Milk chocolate contains minimum 40% cocoa solids, minimum 20% milk solids.Caramel chocolate contains minimum 36% cocoa solids, minimum 26% milk solids.White chocolate contains minimum 36% cocoa solids, minimum 27% milk solids.For allergens, including cereals containing gluten, see ingredients in BOLD. May contain traces of other tree nuts and sesame.